The Church probably first came to Cornwall by slowly spreading from Roman cities like Exeter, and the saints who gave their names to so many Cornish parishes were probably local leaders during the 6th and 7th centuries. Together with Christians in Wales and Brittany they looked to Rome as their head and centre. St Budoc, the saint of the Falmouth area, is also venerated in Brittany and at St Budeaux (Buddocks) near Plymouth. His old church is at Budock, half a mile north of the town. The magnificent natural harbour on the Fal estuary was already known as Falmouth in the 13th century. The port, however, was at Penryn, until in 1661 Charles II granted the charter that turned the former hamlet of Smithwick into the town of Falmouth. A busy new port developed here during the 18th century. French sailors became a regular feature of the Falmouth scene, and by 1800 they had established a Catholic oratory in a loft above a warehouse on the quay. When the place burnt down, a Mr Rowland Conyers, who took an interest in seamen’s welfare, helped to replace it with a building containing a chapel and a priest’s lodging. A Franciscan priest, Ignatius Casemore, was appointed to it in 1803. Place, with an ironwork letter M, disguised as a crown, over the gate. The Abbé died in 1822 and his body now lies under the high altar of St Mary’s. Several priests followed, including England’s first Redemptorists, who came from Belgium and worked here from 1843 to 1848. There was then no resident priest until Fr Laffan came as the first rector in 1860. 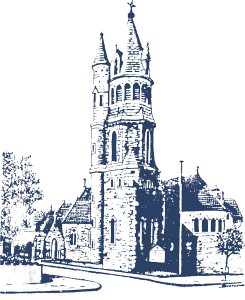 When Fr William Cassey arrived in 1864, the parish began to need a bigger church, and on 26th August 1869 the present St Mary’s was opened by Bishop Vaughan of Plymouth, assisted by the famous Bishop William Ullathorne of Birmingham. The architect was Joseph Aloysius Hansom (1803 – 1882), the man who invented the hansom cab in 1834. The chief benefactors of this period were the quarry-owner Thomas Moor Horsford and the granite-shipper William George Freeman. The best known layman was the distinguished marine painter, Charles Napier Henry (1841 – 1917), whose father, Henry Francis Henry (1818 – 1888), composed such tunes as ‘Jesu, my Lord, my God, my all’ and ‘I’ll sing a hymn to Mary’. Charles married Amy Mary Freeman. He built a house in Kimberley Place next to the church and called it Churchfield. It is now the Athenaeum Club. Canon Cassey died in 1902. Under his successor, Canon James Burns, who died here in 1924, the Catholic Church became better integrated in the life of the town. He added a baptistery and south porch to the church in memory of Canon Casssey, and installed the organ. Electric lighting and the Lourdes Grotto came in 1926. The 19th century windows over the high altar were given by two sisters, Jane H. Sturgeon Coleman (Née Polgase) and Amelia Billar Polgase. They show nine events of the paschal mystery: Christ’s entry into Jerusalem on a donkey; the last supper; the agony in the garden; Christ meeting his mother on the way to Calvary; the crucifixion; the taking down of his body from the cross; the resurrection; the ascension; and the descent of the Holy Spirit at Pentecost. The letters JHS prominent in eight of the inscriptions, are not the Holy Name, but the initials of Mrs. Coleman. The window over St. Joseph;s altar shows a traditional picture of the death of St. Joseph with Our Lord and Our Lady at his side. The window at the side portrays the raising of Lazarus. The big window over the west door, a memorial to T M Horsford and his wife, who died in 1897, shows Our Lord with Our Lady and the saints as they might be in Dante’s vision of heaven as a great rose. In the baptistery are two windows made by Father Charles Norris of Buckfast Abbey and given by Canon Cantell about 1948, when the Sacred Heart altar stood here. One shows the stream of living water flowing from the heart of the dead Christ. The other shows Blessed (since 1970 Saint) Cuthbert Mayne, the first martyred Elizabethan seminary priest. He was arrested at Golden, not far away across the Fal estuary, on 8th June 1577, and executed at Launceston on the following 30th November. The statues of the Sacred Heart, Our Lady and St Joseph are handsome works in carved wood, as are those of Our Lady and St Bernadette in the Lourdes Grotto, and the stations of the cross. They were all put in by Canon Cantell, who also had Fr. Norris design the tester or canopy that hangs over the high altar. The original stone statue for the Lady Altar now stands outside the west door of the church. The other statues are of ‘the Little Flower’, (St Therese of Liseux 1873-1897), St Anthony of Padua (1195-1231) and St John the Baptist. The statue of St John is above the door of the reconciliation room, which was the baptistery when the statue was set up. Falmouth was bombed several times during World War II. In 1941 a bomb destroyed the house on the corner of Kimberley Place, hard by the church, and severely damaged the church roof and windows. Canon George Cantell, who arrived in 1946, was much involved in the Liturgical Art Movement of the period. He prepared the church for consecration by Bishop Grimshaw on 8th September 1948. The most learned of Falmouth’s priests was Canon George Ford, Chancellor of the Diocese, who came in 1952 and further integrated the Catholic parish with the life of the town. He died suddenly on 10th November 1961. The first Catholic mayor of Falmouth, Norman Fittus, held office from 1967 to 1969. During the 1970s, in the liturgical changes resulting from the Second Vatican Council, the baptistery was moved to the Sacred Heart chapel and the former baptistery became the reconciliation room. St Edward’s church at Mawnan Smith was built in 1964.